More than 800 armed police have arrived Wednesday at Wenchuan, the epicenter of the massive earthquake that struck Southwest China, and started rescue operation, according to Xinhua News Agency. As of 12 am, two helicopters of the Chinese Liberation Army (PLA) has airdropped six tons of food, drinking water, tents and medicine to the quake-hit Yingxiu Township in Wenchuan County, the CCTV reported. Three more helicopters carrying most needed life necessities are also en route to Yingxiu, Xinhua reported. Meanwhile, the first batch of 100 elite soldiers selected from the airborne special force were parachuted into an area near the epicenter for disaster relief, in an effort to speed up the deployment of rescuers, Xinhua said. The paratroopers landed safely in cut-off Maoxian county, northeast of Wenchuan on 12:20 pm. The situation in Yingxiu Town of Wenchuan County, the epicenter of Monday's massive earthquake, was worse than expected with traffic cut off and children buried in debris, according to local government officials who treked into the area late on Tuesday. Only 2,300 people out of the town's population of more than 10,000 were believed survived the quake, and more than 1,000 of the survivors were badly injured, He Biao, deputy secretary-general of the Aba prefectural government, told CCTV. Survivors desperately needed medical help, food and water, He said. Cries for help were heard from under the debris of a local school, but people had to dig with their hands, since blocked roads were preventing machinery from reaching the site. A 300-strong taskforce also made its way into Wenchuan county early Wednesday morning after walking through miles of muddied mountainous path, according to CCTV. Two remote-sensing planes of China's naval forces departed from Beijing at 7:00 am Wednesday to quake-hit Sichuan to help collect data of the region. Up to now, a total of more than 50,000 military and police personnel have been dispatched to quake-hit Sichuan Province as time ran out for thousands of people buried under rubble and mud. The national death toll has climbed past 13,000 following the 7.8-magnitude quake on Monday. 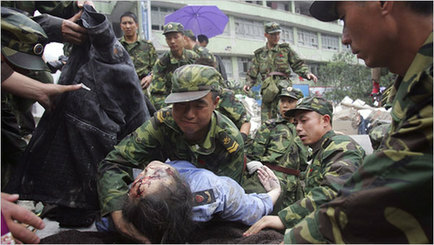 In parts of the quake-hit cities of Dujiangyan and Mianyang, soldiers removed debris and dug out victims by hand, as damaged roads had prevented bulldozers and rescue equipment from entering the areas. The town of Yong'an, the gateway to the mountains of Beichuan County, is the scene of one of the largest rescue efforts by the China's government, with convoy after convoy of military trucks, and ambulances rumbling up there. Zhao Picong, an officer with the publicity department of the Chengdu Military Command that covers Sichuan and several neighboring provinces, said his fellow soldiers were pushing ahead with the rescue efforts "at all costs". "Our troops didn't even assemble. We started off immediately after receiving the order," Zhao told China Daily. "There is no time to hesitate or feel the pressure. It's an extremely urgent situation and we're going into full gear." Zhao also said he was concerned about a lack of medical staff and poor traffic and telecommunication connections. He was unable to contact some of his troops Tuesday. 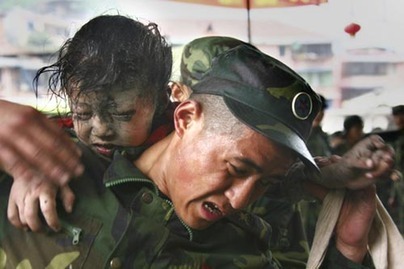 But as reinforcements arrive and infrastructure gets restored, rescue efforts will move more efficiently, Zhao said. The Central Military Commission has also called on the army to view rescue and relief efforts as "the most imperative and significant political task at present". "All the troops in the relief efforts should break conventions, take exceptional measures, and race against time to get in place as soon as possible," the commission ordered.